This post is a follow up to my “Managing BitLocker using MBAM” session at the Midwest Management Summit 2017 (MMS). In this post I will try to explain the installation process a bit more in detail, and why I use PowerShell for the installation. When installing MBAM the first thing to do is to run the MbamServerSetup.exe installer which contains the MBAM 2.5 SP1 installer components. This installer installs the PowerShell modules that are used by the MBAM Configuration wizard which is used to install the actual MBAM features such as databases, web services and reports. One thing that I have seen go wrong for may IT admins attempting to install MBAM for the first time, is the fact that the server setup allows you to launch the roles wizard after installation. Do NOT run the wizard yet, if you do so you will install using the RTM version, and not the latest version. Before installing the MBAM features, the latest servicing release needs to be applied, as this will update the MBAM Configuration wizard and the underlying PowerShell modules and binaries. After applying the MBAM2.5_Server_x64_KB4014009.msp the MBAM Configuration wizard can be launched from the start menu. Depending on infrastructure requirements and the MBAM topology selected for the implementation, MBAM features needs to be installed and configured on different servers. This requires installing and patching the MbamServerSetup.exe on each server. before adding features. For this I recommend using the PowerShell modules directly, as opposed to using the wizard. The reason for this is the fact that every time a new service release is released, it is necessary to remove all MBAM features (database is left untouched) and install/configure again after applying the service release. Reason for this is the fact that only the wizard and underlying binaries are touched by the update. By using PowerShell, this process becomes much simpler and less time consuming, as the scripts can simply be rerun to install and configure components again. In my lab I have MBAM installed in a hybrid topology, where compliance is reported to both the MBAM database (stand-alone topology) and Configuration Manager HW Inventory (CM integrated topology). I have created a DNS A-record (mbam.corp.viamonstra.com) that points to the IP of the IIS server that hosts the MBAM web services. This allows easier conversion to a high-availability scenario later, without having to reconfigure endpoints for all clients. The SSL certificate is issued against the a-record, and installed in the IIS servers private certificate store. In my lab I have placed the DBs on the ConfigMgr server, but in a real-world environment I always try to put the databases on a HA (SQL Always ON) Cluster. and SQL Server ScriptDom installed. #Enter the fqdn and port of the SQL server (port is only needed if port is different from 1433). #Name of the Recovery and Hardware database that is created. #Name of the Compliance database that is created. #Name of the Active Directory group created for the "MBAM DataBase Read Write" group. In <domain>\<groupname> format. #Name of the Active Directory group created for the "MBAM DataBase Read Only" group. In <domain>\<groupname> format. The Configuration Manger integration consist of collections, Configuration Items, Baseline and reports. Purpose : Creates MBAM reports on SQL Server Reporting Server and creates Configuration Manager items. The script must be run from the ConfigMgr Primary Site server with the MBAMServerSetup installed. #Name of the MBAM Compliance and Audit Database service account created in AD. Use <domain>\<groupname> format. # or change script to prompt for credentials. #Name of the Active Directory group created for the "MBAM Audit Report". Use <domain>\<groupname> format. In my Lab I have all web services on a single server, these can be split up or duplicated in a HA scenario. Purpose : Installs MBAM websites to IIS and configures SSL certificate and application pools. 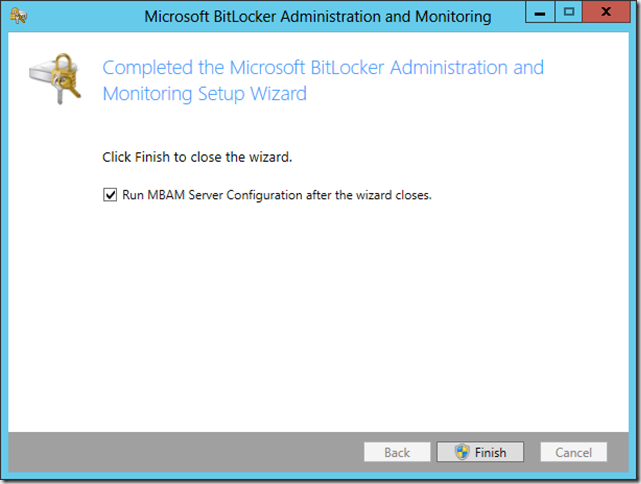 The script must be run from the MBAM IIS server with the MBAMServerSetup installed. #Name of the MBAM Web Application Pool service account created in AD. Use <domain>\<groupname> format. #or change script to prompt for credentials. #Name of the Active Directory group created for the "MBAM HelpDesk Users". Use <domain>\<groupname> format. #Name of the Active Directory group created for the "MBAM Advanced HelpDesk Users". Use <domain>\<groupname> format. #Name of the Active Directory group created for the "MBAM Compliance Report Users". Use <domain>\<groupname> format. #Name of the organzation as it should appear on the Self Service Portal. #Name of the DNS alias created and used for the web server certificate. The MBAM CmdLets allow for testing of pre-requisites etc. before running the actual Enable CmdLets. To do this simply replace Enable- with Test- and run the scripts. Before applying a service release, remove any installed features by running the appropriate PS CmdLets. These are the cmdlets I use for removing features in my Lab. Note: There are no CmdLets for removing the databases, as these must be kept during an upgrade. If for some reason the databases must be deleted, they must be deleted through SQL tools. I hope this blog helps clarify some of the questions on the MBAM setup process. It looks like this post would be incredibly helpful… if it was not posted with this code highlighter app. All I get is tons of junk of the colors its trying to make the text. The Webapp you have for posting code already has the powershell highlights.